1 How to win Ultimate Ears Megaboom from Amazon Ultimate Speaker Quiz Time? 2.1 Q1) The entire range of Ultimate Ears speakers does NOT have which of the following features? 2.3 Q2) The Ultimate Ears Wonderboom speaker can be immersed in a pool. 2.5 Q3) What is the maximum battery life of Ultimate Ears megaboom wireless bluetooth speakers? 2.7 Q4) How many Bluetooth enabled source devices can be paired with Ultimate Ears Wonderboom? 2.9 Q5) Which of these speakers do NOT offer 360 degree sound? 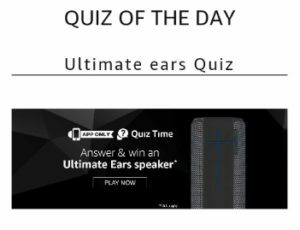 Amazon is back with a new Quiz Time, and we added all the answers of Amazon Ultimate Speaker Quiz. 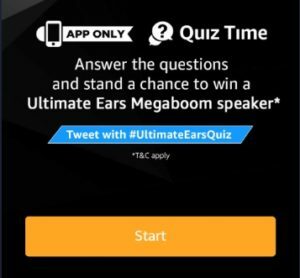 In this quiz, 6 winners will get Ultimate Ears Speaker just by answers 5 simple questions. Ultimate Speaker is a portable speaker manufactured by Ultimate Ears, supporting Bluetooth and wired connections. Ultimate Ears MegaBoom has been praised for its industrial design, loudness, battery life, speakerphone capability, and its suitability for outdoor use, but criticized for its comparatively high price. So, just check this post to get detailed information on Amazon Ultimate Speaker Quiz Time Answers. Just answer 5 simple questions to get a chance to win Ultimate Ears Megaboom. This quiz will remain live until 25th April 11:59:00 p.m. You have to go to the bottom of the Amazon App Home page to enter this quiz. We also added Amazon Quiz Winners List, you can check that from the below mentioned link. How to win Ultimate Ears Megaboom from Amazon Ultimate Speaker Quiz Time? 2. 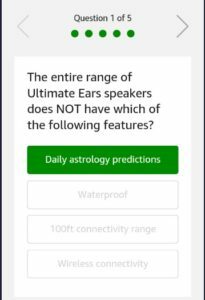 Open the app and you will see a banner about the Ultimate Speakers Quiz Time contest. Click on it. 3. Now click on the ‘Start’ button to begin the Amazon Ultimate Ears Speaker quiz. Q1) The entire range of Ultimate Ears speakers does NOT have which of the following features? Q2) The Ultimate Ears Wonderboom speaker can be immersed in a pool. Q3) What is the maximum battery life of Ultimate Ears megaboom wireless bluetooth speakers? Q4) How many Bluetooth enabled source devices can be paired with Ultimate Ears Wonderboom? Q5) Which of these speakers do NOT offer 360 degree sound? 5. After answering all 5 questions correctly. That’s it. 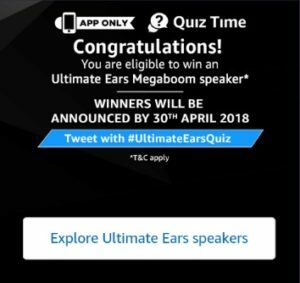 Just wait for the Winners list of Ultimate Ears Quiz. 1. This Contest will commence on 27th March 2018 from 12:00:01 a.m. to 25th April 11:59:00 p.m.